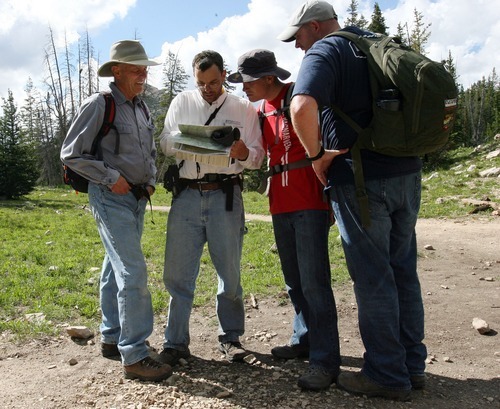 Steve Griffin | The Salt Lake Tribune Aaron Schellenberg, second from left, looks at a map with his father Al Schellenberg, left, his brother Matthew Schellenberg and brother in-law Buck Gay, right, as they search for Aaron's son Joseph Schellenberg who went missing from his camp site on Long Lake two miles above the Crystal Lake Trailhead in the Unita Mountains above Kamas, Utah Tuesday, August 2, 2011. 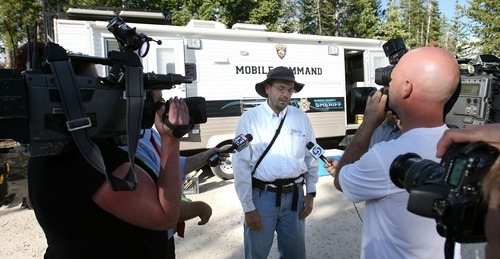 Steve Griffin | The Salt Lake Tribune An exhausted Aaron Schellenberg talks with the media outside the Summit County Sheriff's mobile command center after hiking down the Crystal Lake trail after Summit County search and rescue members found his son, Joseph, who went missing from their camp site on Long Lake two miles above the Crystal Lake trail head in the Unita Mountains above Kamas, Utah Tuesday, August 2, 2011. The Schellenberg family searched all day for their son and were notified by radio that the boy was found several miles away from his camp. Steve Griffin | The Salt Lake Tribune Joseph Schellenberg walks with members of the Summit County Sheriff's department outside the mobile command center at the Crystal Lake trail head after Summit County search and rescue members found him after he wondered away from his camp site on Long Lake two miles above the Crystal Lake trail head in the Unita Mountains above Kamas, Utah Tuesday, August 2, 2011. The Schellenberg family searched all day for their son and were notified by radio that the boy was found several miles away from his camp. 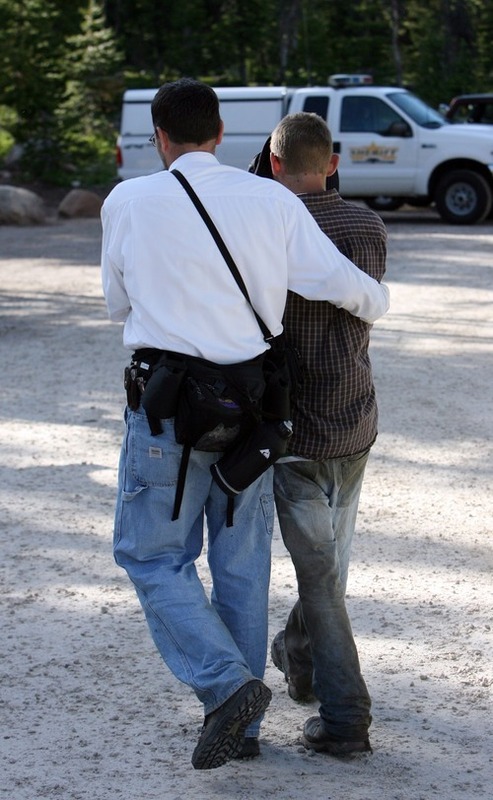 Steve Griffin | The Salt Lake Tribune Exhausted Aaron Schellenberg walks with his son Joseph after they were reunited in the Summit County Sheriff's mobile command center at the Crystal Lake trail head in the Unita Mountains above Kamas, Utah Tuesday, August 2, 2011. 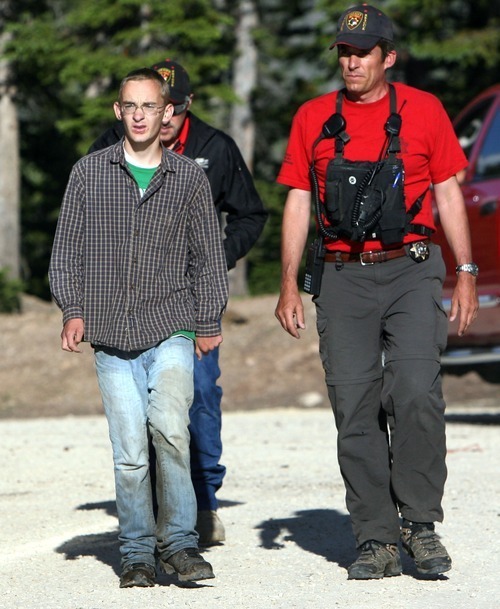 Summit County search and rescue members found Joseph about five miles from the family's camp site on Long Lake two miles above the Crystal Lake Trailhead. The Schellenberg family searched all day for their son and were notified by radio that the boy was found about several miles away from his camp. 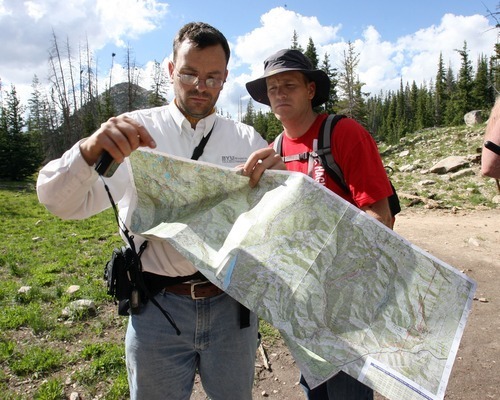 Steve Griffin | The Salt Lake Tribune Aaron Schellenberg, left, looks at a map with his brother Matthew Schellenberg as they search for Aaron's son Joseph Schellenberg who went missing from his camp site on Long Lake two miles above the Crystal Lake Trailhead in the Unita Mountains above Kamas, Utah Tuesday, August 2, 2011. Steve Griffin | The Salt Lake Tribune Jennifer Schellenberg smiles as she races to the Summit County Sheriff's mobile command center with her husband Aaron after hiking down the Crystal Lake trail after Summit County search and rescue members found their son Joseph who went missing from their camp site on Long Lake two miles above the Crystal Lake Trailhead in the Unita Mountains above Kamas, Utah Tuesday, August 2, 2011. The Schellenberg family searched all day for their son and were notified by radio that the boy was found several miles away from his camp. 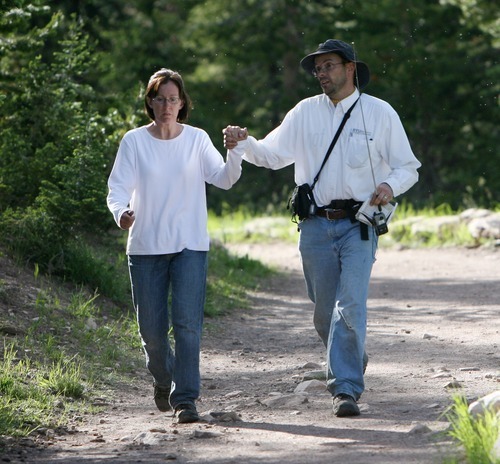 Steve Griffin | The Salt Lake Tribune Jennifer and Aaron Schellenberg hold hands as they hike down the Crystal Lake trail after Summit County search and rescue members found their son Joseph who went missing from their camp site on Long Lake two miles above the Crystal Lake Trailhead in the Unita Mountains above Kamas, Utah Tuesday, August 2, 2011. The Schellenberg family searched all day for their son and were notified by radio that the boy was found several miles away from his camp. An Idaho teen was found about 12 miles from a Summit County campsite where he was separated from his family. Joseph Schellenberg, 17, of Rexburg, Idaho, was camping with his family near Long Lake on Monday night, said Summit County sheriff's Sgt. Ron Bridge. He disappeared some time after 11 p.m., when they went to bed. "Family members woke up ... and discovered he was gone," Bridge said. Schellenberg has a developmental disability, Bridge said. Searchers found Schellenberg about 5 p.m. Tuesday, some 12 miles from Long Lake. It was unclear why he had left the campsite, Bridge said. Schellenberg was not injured.